“Saint Judy” has a stellar cast of fine actors that include: Leem Lubany as Asefa Ashwari, Common as Benjamin Adebayo, Alfre Woodard as Judge Benton, Alfred Molina as Ray Hernandez and Michelle Monaghan as Judy Wood. Together they bring the real-life story of immigration lawyer Judy Wood to life on the big screen. 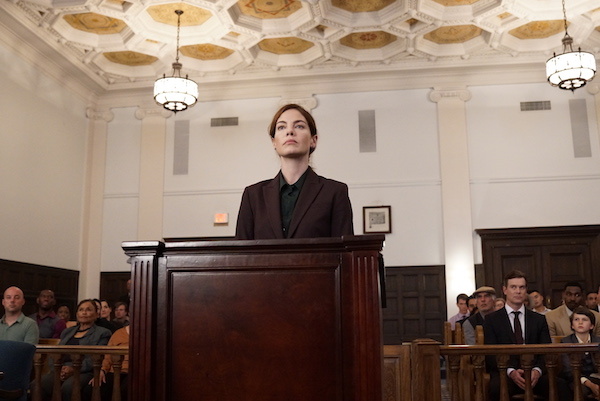 This compelling biography tells the story of Judy Wood, played by Michelle Monaghan, who starts out as a public defender in New Mexico and ends up making history in Los Angeles. There, she changes US laws on immigration in a landmark case for women seeking asylum from persecution in other part of the world. The opening scene tracking shot moves with Judy as she makes her rounds as a public defender, adding a lot of energy and immediacy to the story. The scene portrays her as smart, efficient and decisive, while it effectively pulls the audience into her world. The following scenes offer the back story, showing her as a mother and a woman with a lot on her plate, and also her humanity as she concedes to move to California to have her son be close to his father, who is also a lawyer. Judy’s move to California lands her in Highland Park, deep in the Latino community. A lot of the movie was shot around the Avenues and Figueroa, giving you a great feel for the area. For a lot of us, this is familiar territory, and anchors her solidly in Los Angeles. Once she imbedded in LA, she immediately starts working for an immigration law firm headed by Ray Hernandez, played by Alfred Molina. Her work there introduces her to Asefa Ashwari,a refugee from Afghanistan, played by Leem Lubney. Asefa Ashwari headed a girls school in her own home town in Afghanistan. It was her defiance of local customs and proscribed women’s roles that led to her having to flee and seek sanctuary in the US. Judy, being a thorough and passionate lawyer, interviewed Asefa, who was drugged up and unresponsive in a detention camp in Lancaster. Judy was left wondering what had happened to bring a bright woman like Asefa to this point in her life. This meeting led to Judy championing the immigration cause. The film then shows a series of vignettes that advance the story to trial. Asefa Ashwari’s immigration trial reveals a significant part of her previous life. Asefa’s immigration hearings reveal the opaque qualities of the immigration justice system, that most of us are not aware of. These trials are very different from the constitutional jurisprudence we are familiar with as US citizens. As much as I found the trials to be of interest, I also found the performances of Common, as prosecuting attorney Benjamin Adebayo, and Alfre Woodard as Judge Benton credible, providing insight into the process with their performances. Their performances pointed out the stark rigors of the law as well as the glimmers of the humanity in those who serve the law. There was an interesting observation by Common’s character, Benjamin Adebayo, during the negotiating process, where he mused–and I’m paraphrasing this–when the INS stood for Immigration and Naturalization Service, and then was renamed ICE, which stood for Immigration and Customs Enforcement. It used to be a service, but now it’s enforcement and it is a shame that it has come to this. It’s a salient moment that says so much about America’s current condition and the changes in our immigration policy. After that illuminating observation by Benjamin Adebayo, the movie reaches its resolution and finalizes the story in a court case that forever changes immigration law for the better. “Saint Judy” is a powerful human drama that truly succeeds on a number of levels, and leaves you with a feeling of hope in the challenging atmosphere we live in today. This entry was posted in Movies and tagged Alfre Woodard, Alfred Molina, Asefa Ashwari, Benjamin Adebayo, Billy Bennight, coming-of-age, common, Film Independent, highland park, IFC, immagration, immagration law, indie, Indie Film, Indie Movie, Judge Benton, Judy Wood, LA Film Festival, Leem Lubany, Michelle Monaghan, Movie Review, Ray Hernandez. Bookmark the permalink.